You can wrap anything in a tortilla and call it a taco, but some combinations are more delicious—and original—than others. Here, a few ideas to break out of taco tedium. 1. Braised turkey. It's not just for Thanksgiving, folks. Braise turkey thighs (if you can find them) or legs in beer for an awesome and affordable filling that doesn't taste just like chicken. 2. Pork rinds. Be like chef Roy Choi and add anything you can find at the convenience store, like bean dip, cheese sauce and pork rinds. Hey, he became an F&W Best New Chef with this approach. 3. Salmon. Up your omega-3 intake and make your fish tacos with salmon, preferably wild. 4. Sauerkraut. Top your tacos with pastrami or corned beef, sauerkraut and Russian dressing for a Reuben-inspired taco—or make this version with fried fish. 5. Kale. Yep, kale. It's even good on tacos! Pair the cooked greens with potatoes, or, if you're feeling really ambitious, add Alex Stupak's homemade green chorizo. If you're not crazy about kale, how about Swiss chard (and some scrambled eggs)? 6. Tofu. Marinate and grill this vegetarian staple for a smoky, protein-rich taco filling. 7. Duck confit. Shred duck confit and top with salsa and garnishes for an instant and delicious filling—or make this Asian-inflected version from chef Jose Andres. 8. Nutty salsa. 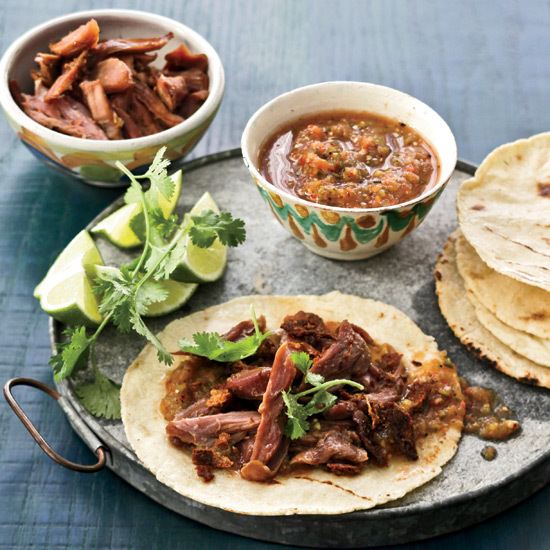 Let a stellar salsa, like this pecan-chipotle one, star. Then relax, and pair it with a standard meat, like grilled steak. 9. Bacon. People love bacon and they love tacos, so why not put them together? Make a BLT taco or this one, with bacon, cheese and jalapenos. 10. Crispy chicken. Instead of the usual grilled or stewed version, top tacos with fried chicken or even bits of crispy skin. 11. Falafel. Create a Middle Eastern–Mexican mash-up and wrap these spiced chickpea patties in tortillas. 12. Crab. Fresh and light, crab tacos are exactly the thing to make when you're at the beach (or want to be). 13. Kimchi. Tacos topped with the Korean pickle known as kimchi are a brilliant and democratic cross-cultural mash-up that, one could argue, have gone on to define a generation's food. Garlicky and usually spicy, kimchi is like the salsa and the vegetable garnish all rolled into one. Try it over any kind of protein, from chicken to tofu.